One of my customers, Kylee, contacted me with a file of a stick man that she wanted to be able to cut out. She had obtained a file from a friend in Brazil and the image was made up of mostly single lines that wouldn’t actually be cut out pieces if you sent it directly to a cutter. In other words, Kylee needed to go from the figure on the left to the figure on the right. 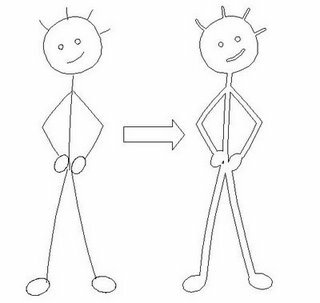 I show, in today’s video, the complete process used to convert Kylee’s Stick Man, i.e. how to use the Round Corner function in KNK Studio to convert single lines to actual closed shapes that can then be welded together to create a single die cut. If you’re not into stick people, this same process can be used in other applications, such as designing your own rickrack. To Swap That Axis or Not! One of the most confusing issues for new users of KNK Studio is what to do about the Axis Swap setting under Cut>Plotting Defaults. And to add to the confusion, that setting works differently in regular KNK Studio versus KNK Studio GE. For users of regular KNK Studio, you control Portrait vs Landscape cutting by having that parameter checked or unchecked. In my video on “Understanding the Sign Blank”, which was created over 6 months before GE was released, I instruct the user to make sure Axis Swap is checked in order to have a Portrait orientation when cutting. If a Landscape orientation is needed, then UN-check that box. However, GE was devised to work like RoboMaster and Wishblade Advance. You control the Portrait vs Landscape orientation from within Layout>Blank Size. Simply check whichever one you want. And under Cut>Plotting Defaults, leave Axis Swap UN-checked ALL the time. Another recommendation involves opening .knk files from other users. Because the owners of KNK cutters have larger cutters, it’s not unusual to open up 12″ x 12″ layouts and some of the settings from that user’s KNK Studio will be sent with this file. To avoid having so much to verify or having to troubleshoot why your file won’t cut as it should, use File>Import versus File>Open when loading these files. You will retain YOUR Sign Blank settings! And, to keep the same image sizes, just left click once when you see the “L” cursor appear, rather than dragging your mouse to create a box. For some projects, it’s often important to keep the exact dimensions that the designer used.